Qatar earned a 3-1 victory over Japan to win the Asian Cup for the first time in their history. 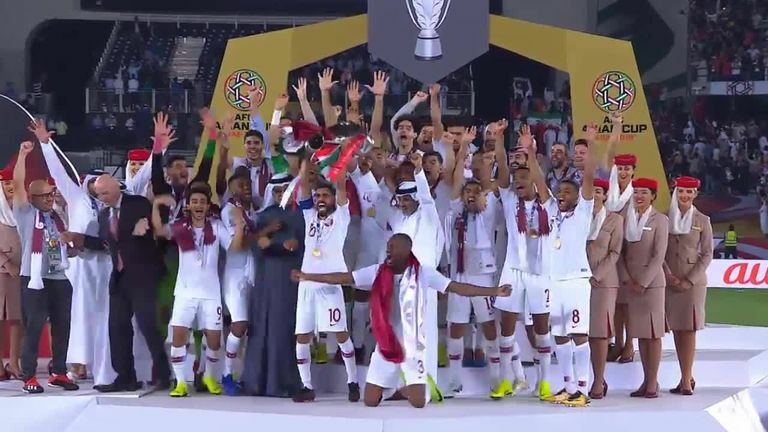 Qatar stunned Japan 3-1 to win their first Asian Cup on Friday sparked by a moment of magic from record-breaker Almoez Ali before nail-biting late drama. Ali became the first player to score nine goals at a single Asian Cup after only being cleared to play just hours before kick-off following a UAE protest over his eligibility. Japan, meanwhile, had never lost an Asian Cup final, winning the last of their record four titles in 2011. But the Blue Samurai were soon chopped down to size by Ali's outrageous opener, taking him past Iran legend Ali Daei's record tally of eight goals at the 1996 tournament. Ali almost scored again within a minute, only to be denied by a desperate block from Yoshida. However, Qatar doubled their lead in the 27th minute after yet another Afif assist - his 10th of the tournament - as Hatim bent in a sumptuous left-foot shot from distance.